Do they work with my off-grid system, are they safe, do they do what I want? 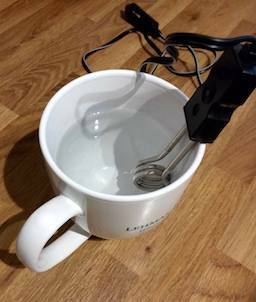 A brief review of a ROADKING 12V kettle and a 12V car/automotive in-cup immersion heater suitable for my off-grid system. All part of Expanding and Optimising Off-grid PV System for Mid-winter. It is worth setting expectations. A mains kettle is typically 2kW to 3kW (2,000 to 3,000 watts) and one of these in-car drink heaters is more like 150W to 180W (10A to 15A as limited by the cigarette lighter socket), thus as much as 20x slower. On the other hand, unlike many mains kettles, these are designed to heat a single cup (maybe even a half-cup) efficiently, which recovers some of the time difference. My main purpose for purchasing these is not preparing for power cuts and the zombie apocalypse; Kingston is far too genteel. My motivation is to test-load my battery system and to soak up some energy that the batteries won't from my 550W main off-grid panels when the sun is out. To that end they are doing what I want, though I'm not likely to use the kettle much, apocalypse notwithstanding! 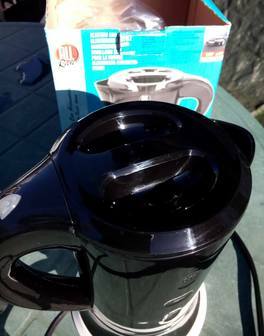 Makes a drink warm efficiently and at a good price, but is worryingly under-engineered. ROADKING KETT021607 "Immersion Heater | 12v" £8.99. (Possibly All Ride part number 871125202160 or close equivalent.) Packaging states: "For a quick hot drink in your car or truck." This was the first device that I tested. As it does not need to heat the body of a kettle as well (making the cup warm doesn't feel like so much of a waste) it was able to get me a warm-enough brew in a eight minutes. Hygiene would be a concern, getting this clean enough once it's been into a used cup for the next drink of the day. But worse is that the wires were getting hot to the touch and starting to melt/stick to other plastic that they were touching. Also there is nothing to prevent the element getting dry or being incautiously touched, nor is there any overheat protection or even a fune. I would not let my kids use this, at least not unsupervised. I'm not throwing it away at 20Wh per hand- and heart- warming cuppa if nothing else is available, but not really safe. 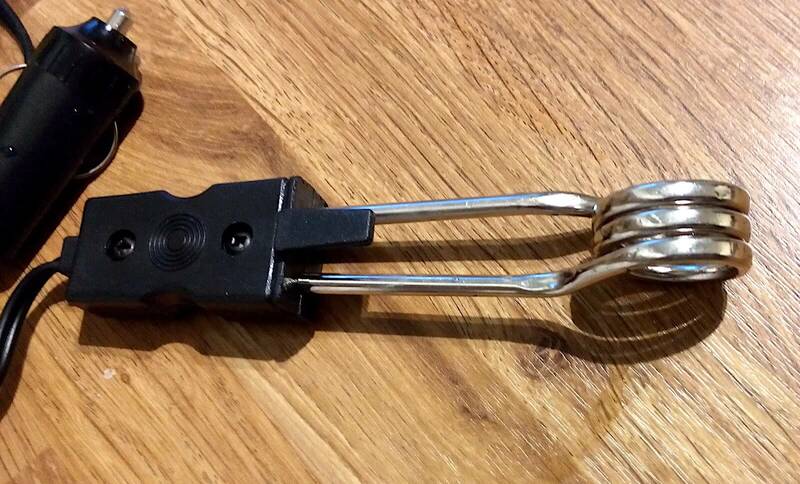 Spec: 12 Volt cigarette lighter plug attached, 1 metre lead, 25mm (W) x 20mm (D) x 130mm (H), ~130W (as measured). Reasonably well-built, has useful indicator light. ROADKING KETT040233M "Electric Car Kettle with Base | 600ml |12v" (All Ride, part number from instruction sheet 871125204023). 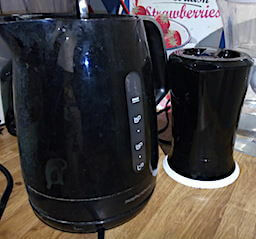 Slower to get a cup of water hot than the immersion, but feels much safer (eg the cable does not get hot), and more hygienic, and doen't look out of place in the kitchen plugged into our 12V off-grid supply, though dwarfed by our mains kettle beside it. One test of the kettle (200ml water) had the water getting hottish after about 8 minutes and just boiling in about 20m. Quite a lot of this energy goes into making the kettle itself warm! Happily accommodates a skimpy cup's worth of water for speed; could accommodate 2--3 cups of water, but you'd be waiting a long time for it to get hot! I did make a big mug of noodles though. Easy for me to plug in and use now when the sun is out. Spec: 600 ml capacity, 12V operation, 175 x 175 x 115mm, 95cm lead and cigar plug fitted, dashboard mounting, 'Soft Touch' on/off switch, auto off and dry-boil protection, ~150W (as measured). ROADKING KETT021607 "Immersion Heater | 12v" (All Ride, possibly part number 871125202160); in cup/mug, in packaging, unpacked. ROADKING KETT040233M "Electric Car Kettle with Base | 600ml |12v" (All Ride, part number from instruction sheet 871125204023); unpacked with box, next to mains kettle. First published 2017-11-04 , updated 2019-04-17 , rebuilt 2019-04-19 . Site copyright © 2007-2019 Damon Hart-Davis. Hosted by ExNet.